Depending on the dog, there can be an extreme difference in behavior in relation to different temperatures. So use it to your advantage to yield faster results. Hot weather- Work on separation anxiety, handling issues, reactivity, and any training situations where you want your dog to be calm and relaxed. However keep in mind that you don’t want your dog to overheat. 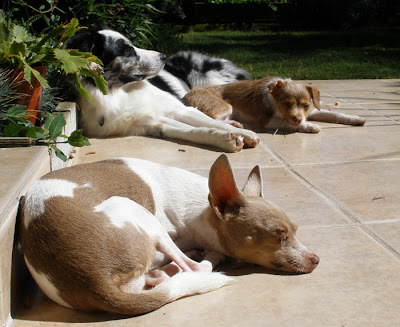 An example: Working on separation anxiety with a Chihuahua by leaving the dog alone in a room lying in a patch of sun, rather than on a chilly evening. Or counter conditioning your dog to nail trimming in the yard in the sun while he’s laying in your lap spread out. Cold weather- use the evening zoomies time to your advantage to work on a trick that needs speed and enthusiasm. I love your videos, Emily, but it's awesome to see you blogging more regularly as well. Thanks so much for sharing your knowledge and expertise with us! I finally have some time!!! :) It's actually quite fun! If you ever visit South Florida, please let us know...would love to come to one of your seminars! I have learned so much watching your videos in conjuction with the great dog training lessons we have been taking here with American Idogs.